Initial jobless claims jumped 7.8% to a seasonally adjusted 385,000, according to a Labor Department report released today. Market analysts had been expecting a 2% dip after the previous week's unrevised 4.7% rise. Source: Author, data from Labor Department. Longer-term trends provide little relief from these newest numbers. The four-week moving average jumped 3.3% to 354,250 after three consecutive weeks of increasing initial claims pushed the average higher last week. Despite the increases, both the most recent week's number and the moving average clocked in solidly below 400,000, a cutoff point that economists consider a sign of an improving labor market. On a state-by-state basis, only Virginia recorded a decrease of more than 1,000 in its initial jobless claims for the week ending March 23 (most recent available data). The state pointed to fewer manufacturing layoffs as the primary reason for its 1,120 drop in initial claims. For the same week, five states recorded increases of more than 1,000. California led the rise with 8,710 new initial claims, citing layoffs in the service, retail, and wholesale industries. Texas (+2,740) and Kansas (+1,610) followed behind, but did not provide any comments explaining their bumps in initial claims. 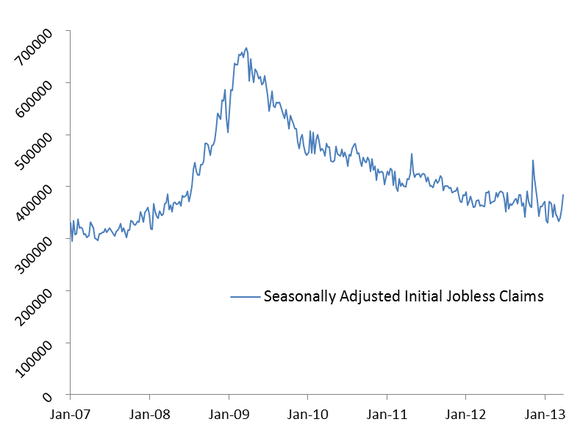 The article Initial Jobless Claims Jump 7.8% originally appeared on Fool.com. You can follow Justin Loiseau on Twitter @TMFJLo and on Motley Fool CAPS @TMFJLo.Try any of our Foolish newsletter services free for 30 days. We Fools may not all hold the same opinions, but we all believe that considering a diverse range of insights makes us better investors. The Motley Fool has a disclosure policy.